West Ham striker Andy Carroll says he has not given up hope of being recalled to the England squad for Euro 2016. The 27-year-old, who won the last of his nine England caps in October 2012, scored a hat-trick in Saturday's 3-3 Premier League draw with Arsenal. Asked if he was thinking about a call-up for the tournament in France this summer, Carroll said: "Without a doubt. "I have to keep that in the back of my head, but I have to play each game here and see how it goes," he told BT Sport. 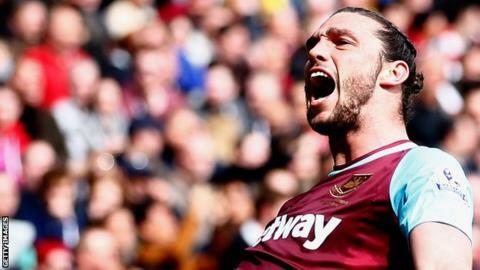 Carroll, who has two international goals, was involved in Roy Hodgson's squad at the last European Championships in Poland and Ukraine in 2012 - opening the scoring in the victory over Sweden in the group stage. The former Newcastle forward has been plagued by injuries since completing a £15m move from Liverpool in June 2013, but he marked his 50th Premier League appearance since then with the second top-flight treble of his career. West Ham manager Slaven Bilic added: "Andy Carroll has everything. It's impossible to stop him. "Watch how many times he tried to get the ball off them. He was keeping the ball, laying it off. "Heading - he's maybe the best in the world. He has to stay away from those injuries. He's professional but he's got to be totally dedicated to his career and football." Should Carroll go to Euro 2016? "Andy Carroll is way down the list of strikers England have got at their disposal. They have a real luxury of strikers. How often does Carroll do what he can do best for West Ham? Taking him to the Euros would be like going back to the dark ages. "Harry Kane, Jamie Vardy, Wayne Rooney, Daniel Sturridge, Danny Welbeck - they are all better players and the game is completely different now. It's not just whack it into the middle and fight for it. When has Carroll ever really been outstanding?" "I would (take him), yes. He's my type of centre-forward. The big man was really up for it and he's been magnificent. "With 10 minutes to go in an England game, he could be an option for Roy Hodgson." Theo Walcott, 2006 World Cup: Arsenal paid £10m to sign Walcott from Southampton in January 2006. He failed to make a single top-flight appearance for the Gunners in the remainder of the 2005-06 season, but England boss Sven-Goran Eriksson made him England's youngest international at the age of 17 years and 75 days, and then took him to the World Cup in Germany. Walcott did not play a single minute at the tournament. Steve Bull, 1990 World Cup: Bull scored 102 goals in two seasons to help Wolves to the Fourth Division and Third Division titles. That form convinced England manager Bobby Robson to call up the striker, who scored on his debut against Scotland in 1989. Bull, whose limited top-flight experience came early in his career at West Bromwich Albion, was included in the squad for the World Cup in Italy. He made four appearances at the tournament - but did not score a goal. Jack Butland, Euro 2012: Goalkeeper Butland was called up by Hodgson because of John Ruddy's injury and went to Poland and Ukraine as England's third-choice goalkeeper, despite having not played a top-flight game at that stage.